Recent release “Nne from Tanzania” from Page Publishing author Dennis Gladwell is a riveting story of courage and resilience personified in four very young girls searching the villages and savannah of Africa for safety and a better life. Dennis Gladwell, a former attorney who became interested in Third World medicine during a trek to Mount Everest, enrolled in nursing school, and set out on medical expeditions to impoverished nations, including Africa, has completed his new book “Nne from Tanzania”: a gripping and evocative story written from the perspective of Africa’s forgotten: the children left behind by the scourge of malaria, HIV, and other diseases that are too often deadly in the developing world. Published by New York City-based Page Publishing, Dennis Gladwell’s tale offers readers a unique glimpse into the lives navigating the challenges, wonder, and dangers faced by children on their own in the villages, cities, and plains of Africa. 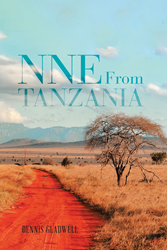 Readers who wish to experience this spellbinding work can purchase “Nne from Tanzania” at bookstores everywhere, or online at the Apple iTunes store, Amazon, Kobo, Google Play or Barnes and Noble.